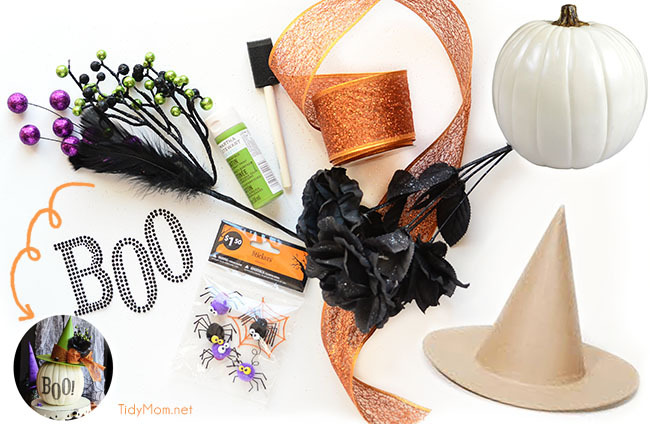 This super easy Halloween craft can be made in no time and displayed with the foam pumpkin with your Halloween home decor or as a witch hat centerpiece . 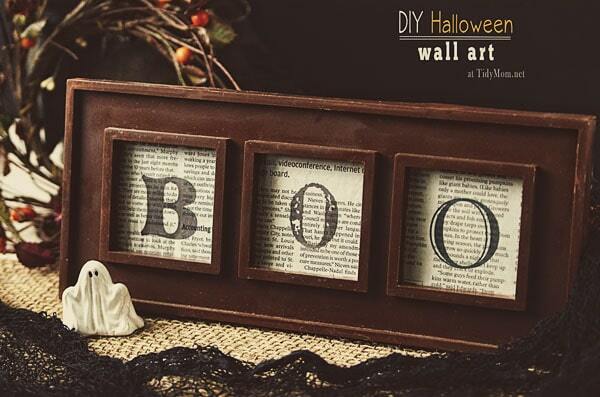 Have you started any Halloween decorating yet? Today I’m sharing a super easy fun idea for decorating a craft foam pumpkin! 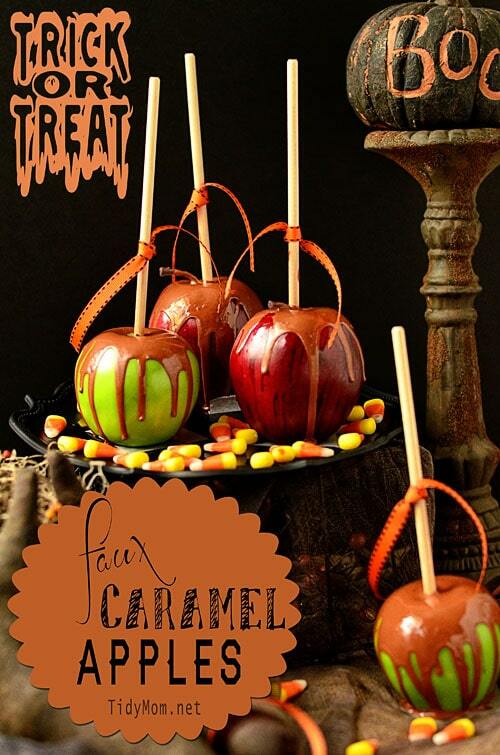 Who ever came up with these faux pumpkins is a genius! Not only are there so many things you can do with them, but I love that you will have them for years to come, instead of throwing them out each year. You could, of course, use a real pumpkin for this easy Halloween craft, since it’s really all about the witch hat. I’m all about easy, and this halloween craft couldn’t get any easier. Allison actually did most of the work, and put it together in about 20 minutes, maybe less. Last year I saw this black and white glam pumpkin and high tailed it to Michaels to buy all the supplies…….and I never got around to making it. The nice thing about that is, when we were looking for a halloween craft, we already had everything we needed in our craft closet! 1. Cover work area with a old newspaper, cloth or wax paper. Use sponge brush to paint 2 coats of paint on the unfinished witch hat. Set aside to dry about 15 minutes. 2. While hat is drying, add BOO! rhinestones to pumpkin. **I purchased this decal at Michaels last year, if you can’t find the exact one you can decorate your pumpkin however you’d like. Eyeglasses in vinyl would be super cute! 3. Measure out enough ribbon to wrap around hat and tie a bow. Using wired ribbon will allow a much prettier bow, it will give your bow more body, it’s more sturdy and really easy to work with. Tie ribbon in a bow around the had and fluff the loops. 4. Cut small pieces of Halloween floral picks and tuck into the bow. You could use hot glue here if you can’t get them to stay in place. 6. 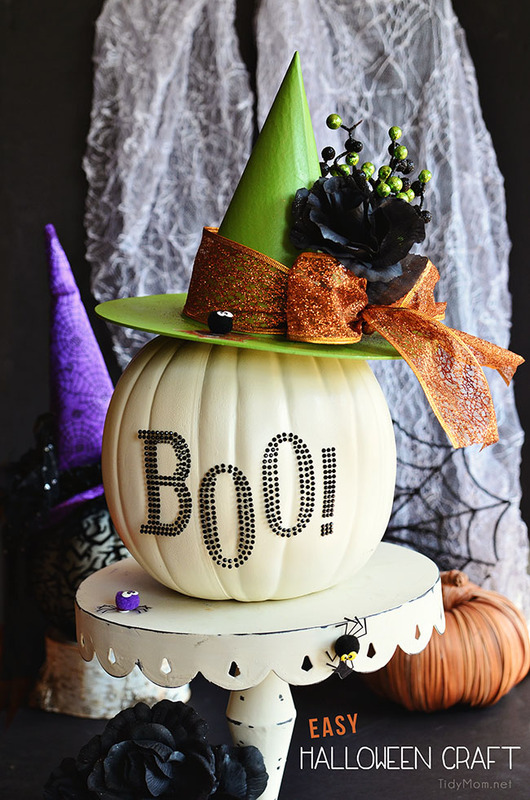 Place hat on pumpkin and use in a Halloween display. 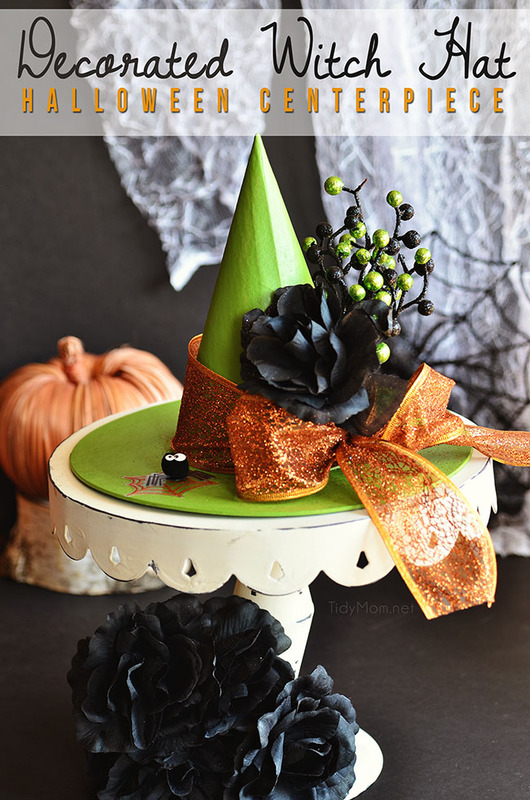 Another option would be, to forgo the pumpkin completely and place your hat on a cake stand or directly on a table of shelf for a super easy Halloween centerpiece. Either way, it would make the perfect decoration for a Halloween party or Halloween home decor on a table or fireplace mantle! 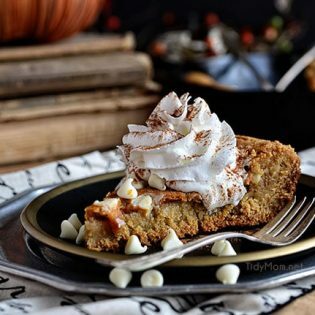 If you have an enclosed porch, put the decorated pumpkin centerpiece displayed on a table as a way to welcome Halloween guests or trick-or-treaters. This is awesome!!!!!! You are so crafty and clever!!!!! I LOVE witch themed crafts!! I LOVE it! My girls will have a blast making the hats! I love the Rhinestones for “BOO”. So original and it does not look difficult, something I could handle. Love the cute little witch hat! Just adorable! Love this Halloween Decor. Especially the hat! 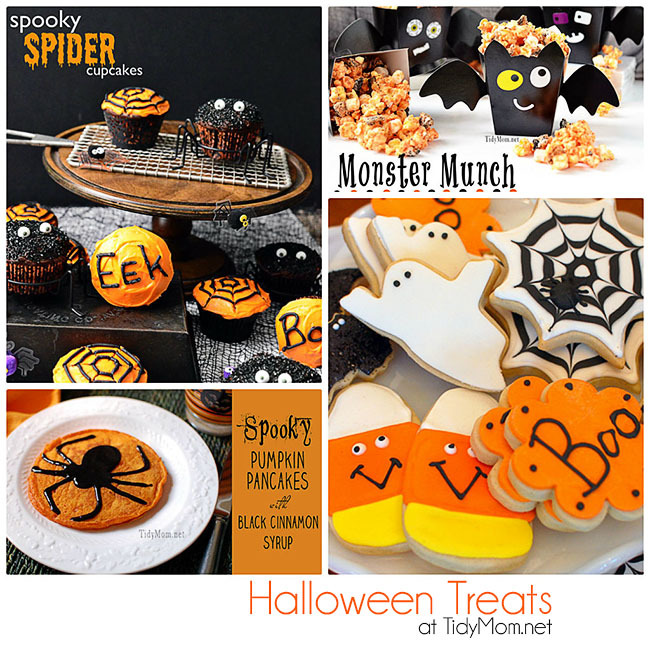 I love these Halloween ideas. Very stylish and clever! I found your link on the Link Party Palooza. 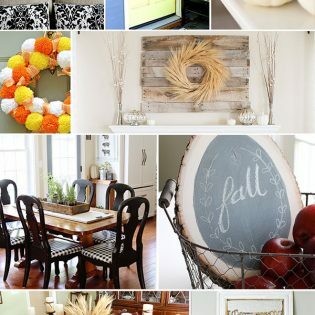 Pingback: Great Ideas -- 18 DIY Pumpkins! Love it! 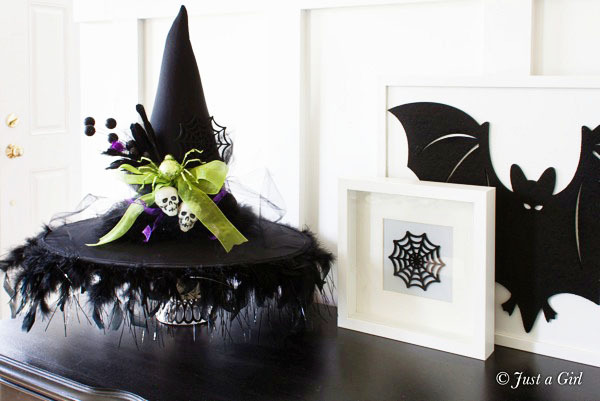 I’ve got a think for witch hats and use them a lot in my Halloween decor, and I love pumpkins too – how fun to combine the two!